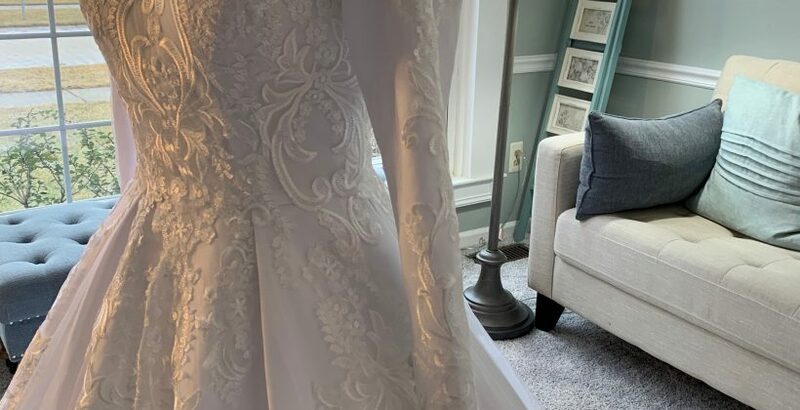 If you’re a Hijabi Bride, it might be really hard to find the perfect Hijabi Wedding Dress that looks stylish while being modest at the same time. 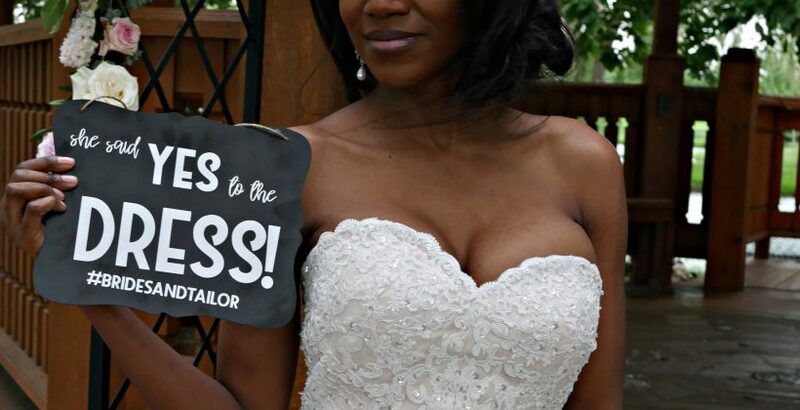 So many times, a bride visits local boutiques, and realizes that the only dresses she loves are the ones that are strapless and need an inner shirt so she can wear it. 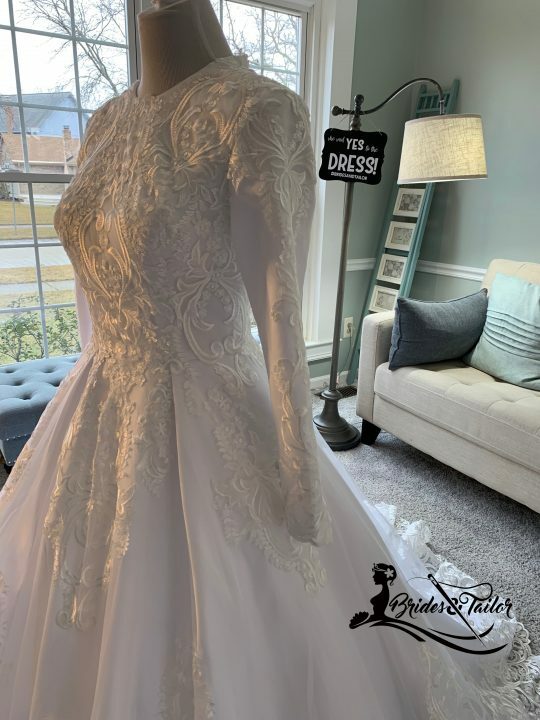 At Brides & Tailor, we want you to choose something that you truly love! 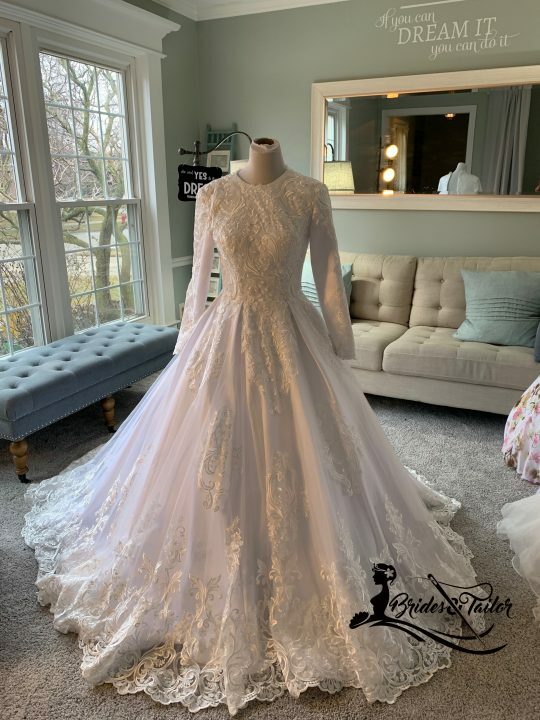 We can create a modest bridal gown with incorporated long sleeves and a high neckline to make sure that all the points you’re looking for are there,without having to wear anything else! 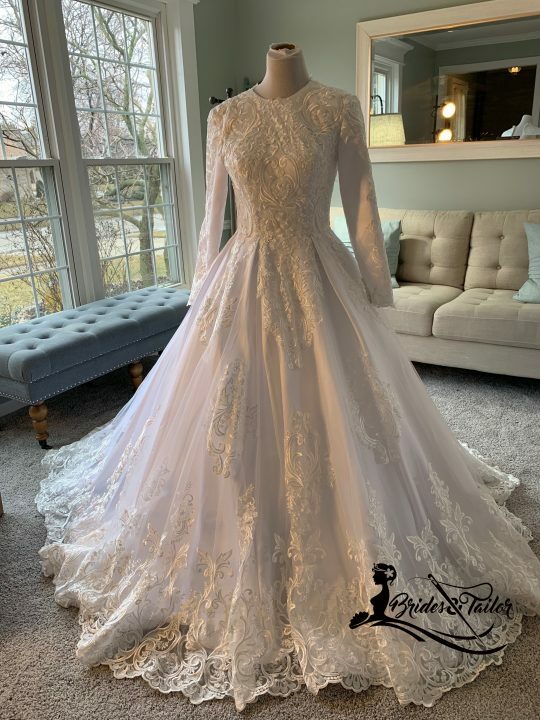 Take a look at this beautiful Hijabi Wedding Dress that we’ve tailored to our beautiful bride Razan from Cincinnati,Ohio. 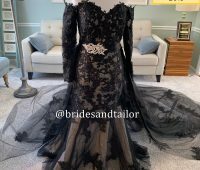 Whether you want a Mermaid Wedding Dress,Ballgown Wedding Dress,an Aline wedding dress, or any other style, we will work with you to create something that’s truly unique and different! 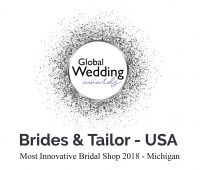 Serving brides from Michigan,USA to all US States and Worldwide! 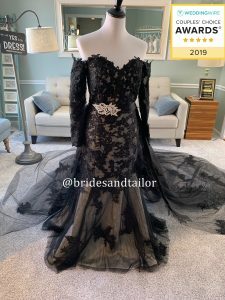 It’s true that it takes a very daring bride to wear a Black Wedding Dress for her Wedding Day instead of the traditional white/ ivory wedding gowns. 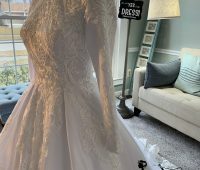 At Brides & Tailor, we’re always so happy to receive custom bridal gowns from brides who love to be unique. 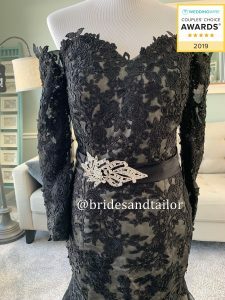 Whether it’s a black Wedding Dress to match a Gothic Wedding Theme, or a pink wedding dress for the perfect ethereal wedding colors, we are always here to make sure our brides get the best experience of their lives. 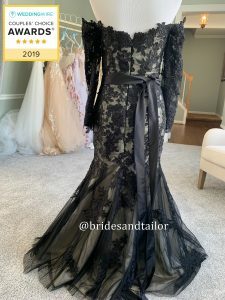 Take a look at this beautiful black wedding dress ( images are below) we’ve designed for our beautiful bride Samantha from Connecticut, USA! 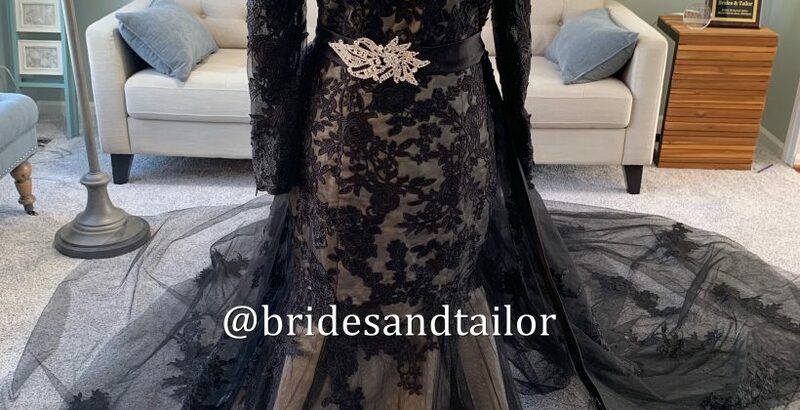 It features a removable long tail with beautiful floral patterns, in addition to a removable belt that can also be removed. 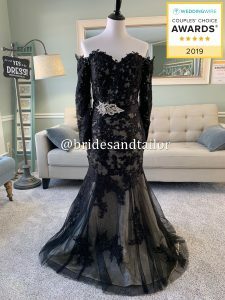 It has off shoulders and a combination of a Mermaid/ ALine silhouette to give her the sexiest silhouette. 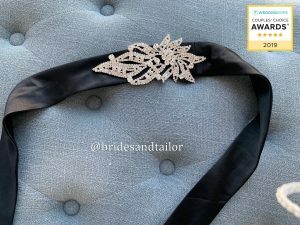 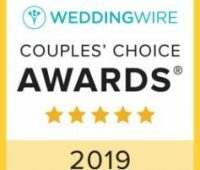 Contact Award-Winning Brides & Tailor USA today and allow us to tailor the gown of your dreams in any color, style or size! 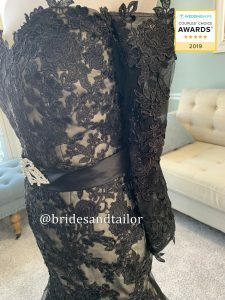 Today at Brides & Tailor we will be covering important basics for getting the perfect wedding dress for your body shape. 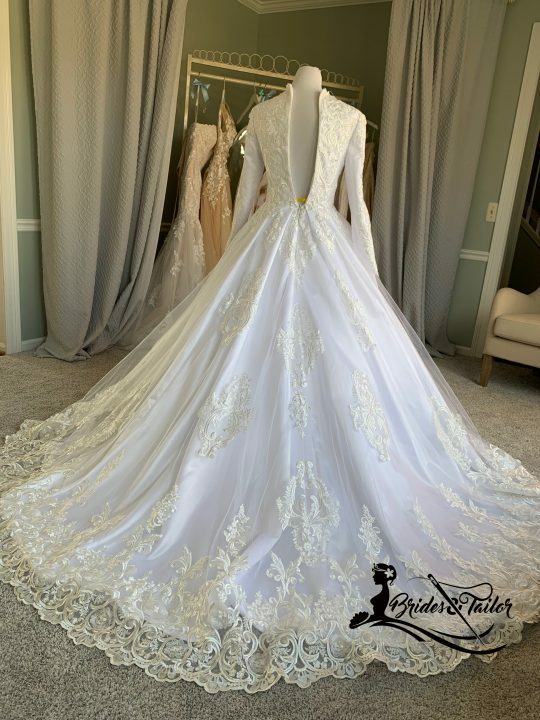 Your pick of the wedding dress should be suitable for the wedding dress veil as well.